GMP , GLP , ISO:9001 , ISO:14001 Certified Plant and WHO GMP (COPP) certificates for several vaccines. 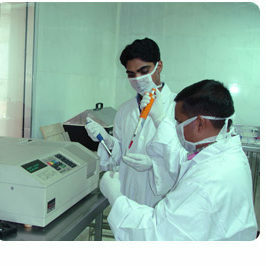 Bio-Med’s R&D laboratories are recognized by Department of Science & Technology, New Delhi, since March 1990. Pioneers in the field of Bacterial Polysaccharide and Viral Vaccines. 1st company to introduce OPV (Oral Polio Vaccine) in plastic tubes which have been highly appreciated over glass vials by medical fraternity. 1st company to introduce VVM (Vaccine Vial Time Temperature Indicator) label on oral polio vaccine in India. In 1998: 1st company in India to give the nation its own Typhoid Polysaccharide Vaccine ( Bio Typh™) . More than 50,000 doses of Quadri Meningo™ vaccine were used to vaccinate hospital doctors, paramedical staff and public at large during the Meningococcemia outbreak in Delhi and its nearby areas in May 2005. This extensive use in one location more than proved the safety of the Quadri Meningo™ vaccine and brought the confidence of the government and public at large in the indigenous product as to quality and availability on demand. CTD Dossiers in internationally accepted format.